Heroes Community - How do you pass Tower 51? Heroes Community > Summoners Academy > Thread: How do you pass Tower 51? Edited by Galaad at 20:42, 13 Dec 2017. It appears there is many way to do it, share yours with your team here! A pretty horrible party for 51, no multipliers working, it can happen that the Hunchback dies before the silence then a start-over is required... But I can't afford to reroll so I just go with that waiting for new creatures. New team (since a while actually but was too lazy to take/crop screen), with this one I clear the level in less than 2 mns. Also a viable PvP team BTW. posted August 30, 2017 10:27 PM bonus applied by Galaad on 12 Oct 2017. Edited by Brukernavn at 22:50, 30 Aug 2017.
posted October 08, 2017 10:18 PM bonus applied by Galaad on 12 Oct 2017. In wave one, the megalodon often dies, as it is color countered, but I use the trogolodyte to rezz it. In Wave two I need to keep the trogolodyte at full hp all the time, or it will get oneshotted. The combination of assassin tome and another red creature (Fire giant) makes it so the AI mostly stay away from my rezzer. The last wave I rarely use more then one nuke each round, as the creatures get debuffed when attacking with a special. When the final boss is about to use silence, I stun it and nuke it down with megalodon x8. Often I kill him before he uses the silence. posted October 08, 2017 10:24 PM bonus applied by Galaad on 12 Oct 2017. Edited by AlHazin at 19:38, 13 Oct 2017. My survival team for level 51, composed of one legendary and four epics. The Hunchman is here principally to resurrect the Siren which dies in first hit of first wave. The Siren, being here for cleansing as well as healing as it is a better healer than the Hunchman. The Cocatrice is the stunner of the team -5 turns per stun and 8 when fully awoken. The Draconic and the Valkyrie are buffers/dispellers, the Draconic casts protection from debuffs which helps resist the Fallen Angel's debuffs and dispels all enemy buffs, the Valkyrie buffs everything with + 35% (+ 45% when awoken enough) -including luck which coupled with the resistance to debuffs protects very well against the Fallen Angel's silence- and cancels a single enemy buff at each special activation -but here the Draconic is way better then her. Her main advantage is that she hits one target avoiding problems with the sorceress on wave 2. Only two x4 combos are working in this team and it didn't take long for me to pass the level, maybe 7 minutes and the teams works well with both versions of the level. posted October 09, 2017 12:05 PM bonus applied by Galaad on 12 Oct 2017. Edited by Galaad at 10:42, 12 Oct 2017. First wave is basically carried by the statue while the dwarf cleanses the enemy team whenever it's needed. 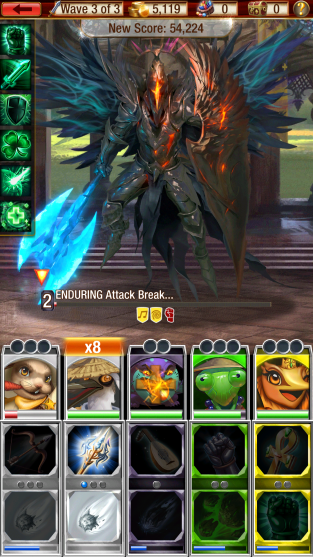 Second wave i avoid using statue's special, as it seems that while the buffs are active the black balls stop appearing. Otherwise easy, i try to always have one dwarf special attack ready for Frozen Regeneration cleansing. Third wave: i try to always have the statue buffs active. Then, after i stun with green giant i use all the specials i can use then cleanse the debuffs with the druid before the boss has the chance to attack again. Before the silence turn i buff luck with the elephant. If the druid escapes the silence, cleanse all debuffs and kill. IF the druid doesn't escape the silence the statue Mend is enough to keep all the creatures alive until the silence wears off, so i just attack with the lowest hp creature. When the silence wears off -> kill. [..] IF the druid doesn't escape the silence the statue Mend is enough to keep all the creatures alive until the silence wears off, so i just attack with the lowest hp creature. When the silence wears off -> kill. You wait for 99 rounds to wear off? Yes, i just normal attack until it wears off. Edited by AlHazin at 19:33, 13 Oct 2017. Nicolai since you have the luck buff from Elephant with + 45% to chance, if you have anything that casts protection from debuffs you can highly increase your chances of resisting the 99-turns silence in wave 3. In my case this is what happens, + 35% chance from Valkyrie's buff (for a maximum of + 45% so it's like Elephant) + the protection against debuffs cast by the Draconic Templar (around + 39% if I'm not mistaking), these two combined make 3 out 5 creatures and sometimes 4 out of five resist the Fallen Angel's silence which will buy you a lot of time and energy. I don't know if there are any legendaries that cast protection from debuffs or a luck buff that goes above 45%, maybe Peri or Djinn I'm not sure, but those can be great as well. And never forgetting to bring a dispeller along as it's really handy against every boss in that floor (I see you have the Battle Dwarf but there are better dispellers), cancelling that mend buff, or even the crazy + 1000% luck against Anubis. posted November 02, 2017 12:46 AM bonus applied by Galaad on 02 Nov 2017. Edited by discopalace at 00:56, 02 Nov 2017. I quickly realized my reds and blues died too easily - even my starting phoenix and frost giant. So I had to make an alternate team. The thunder giant's stun, with high luck, is amazing. It lands most of the time. Combine that with the treant's 2-turn silence, and you really slow down the last boss. I usually do a stun, then silence, and stun, which locks the boss for 15+ turns. This allows me to kill the boss even before the 99-turn silence counter begins. Oathkeeper is a really durable, tanky kind of guy. His protection is useful, and he debuffs the enemy. So that can remove the huge luck bonus or the mend from the bosses. The statue is a great creature, even as a medium. The debuff is great, especially luck debuff. The treant's luck isn't super high, so any debuff of the enemy can help the treant cast silence more successfully. And the Mend really helps with these long battles. Druid is pretty self-explanatory. Great heals. The cleanse removes the fatigue debuffs. One weakness I have is when fighting the blue boss, pretty much only the thunder giant does damage. Also, the only combo multiplier I have is with the statue, as my normal parties funnel mana to red. So the fight is quite slow. But it works out ok, as my team is able to defend and recover with heal/mend. This is nice and all, but where are the level 50 hints for druid battle? I hope to get more people sharing their teams and strategies for this tower level, I know it helped me a lot to see others teams when I was struggling myself. This thread is about Tower 51, feel free to use the Tower discussion thread for anything related to Tower. The first battle with the genie was not too difficult, a pretty standard tough battle. The second battle with the sorceress introduces tricky rules. The sorceress can be damaged by yellow creatures and any other creatures with combo activated. She summons an assistant for any special ability that affects HER and that was the crucial discovery for me. She does not summon when I use a special ability that does not affect her - for example healing or resurrection. Even later (after defeating her for the first time) I discovered that I can safely use damaging specials on her assistants as long as she doesn't get damaged or debuffed. I could beat her with my standard team by skillfully using combos and not using the statue (does debuffs and triggers assistant summons) and using hunchback to resurrect. posted November 08, 2017 02:47 AM bonus applied by Galaad on 08 Nov 2017. Edited by Markmasters at 02:56, 08 Nov 2017. Thanks To answer your Q, I just need one non-silenced rezzer alive. He can resurrect the other rezzers which get cleansed by dying. Hippogriff's protection helps to ensure that either one of three rezzers or faerie dragon with cleanse remains unsilenced. If Hippogriff remains unsilenced he can cleanse too. Six quality points in a single page! The Galaad regime is for the people. Edited by Galaad at 20:37, 13 Dec 2017. Size matters, video from Mantastic beating that level with small creatures only. posted January 06, 2018 08:12 AM bonus applied by Galaad on 06 Jan 2018. Edited by Miervaldis at 18:49, 06 Jan 2018. Made it, mostly thanks to the shrine boosts and some new 4dots. Feilong for buffs and cleanse, Troglodyte for healing and resses, Light Elemental for damage, Lurker for soaking attacks, and Empress for debuffing. 8x combos for the last two. Worked nicely, though keeping the Troglodyte alive during the sorceress battle was the hardest part. You might notice a complete lack of yellows. That's because RNG has never given me any good ones. Gotta work with what you have. So I'm still a noob when it comes to tower 50/51 floors. So I have to ask why all the hype with using only small creatures to fight them?